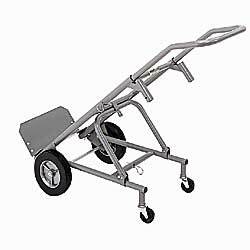 Converts from a standard hand truck or four-wheeler to a tilt truck or a steerable dolly in a matter of seconds. Baked enamel finish. Color: gray. Ships via small package carrier. IN STOCK. ZA-2490 32	 500	 350	 14x8"	 55-1/2"	 20x47"